In the battle of the batteries, lithium-ion technology is the reigning champion, powering that cellphone in your pocket as well as an increasing number of electric vehicles on the road. But a novel manganese and sodium-ion-based material developed at The University of Texas at Dallas, in collaboration with Seoul National University, might become a contender, offering a potentially lower-cost, more ecofriendly option to fuel next-generation devices and electric cars. Battery cost is a substantial issue, said Dr. Kyeongjae Cho, professor of materials science and engineering in the Erik Jonsson School of Engineering and Computer Science and senior author of a paper describing the new material in the journal Advanced Materials. As manufacturers—and consumers—push for more electric vehicles (EVs), lithium production may have a hard time keeping up with increasing demand, Cho said. According to a recent report by the International Energy Agency, the global electric car stock surpassed 2 million vehicles in 2016 after crossing the 1 million mark in 2015. The report notes that, depending on the policy environment, there is a good chance that it will range between 9 million and 20 million by 2020 and between 40 million and 70 million by 2025. In terms of cost savings in the EV battery, using sodium would be less expensive because sodium is more abundant, but it has some drawbacks. "Lithium is a more expensive, limited resource that must be mined from just a few areas on the globe," Cho said. "There are no mining issues with sodium—it can be extracted from seawater. Unfortunately, although sodium-ion batteries might be less expensive than those using lithium, sodium tends to provide 20 percent lower energy density than lithium." The energy density, or energy storage capacity, of a battery determines the run time of a device. "We used our previous experience and thought about these issues—how can we combine these ideas to come up with something new to solve the problem?" Cho said. A battery consists of a positive electrode, or anode; a negative electrode, or cathode; and an electrolyte in between. In a standard lithium-ion battery, the cathode is made of lithium, cobalt, nickel and oxygen, while the anode is made of graphite, a type of carbon. When the battery charges, lithium ions move through the electrolyte to the anode and attach to the carbon. During discharge, the lithium ions move back to the cathode and provide electric energy to run devices. "There was great hope several years ago in using manganese oxide in lithium-ion battery cathodes to increase capacity, but unfortunately, that combination becomes unstable," Cho said. 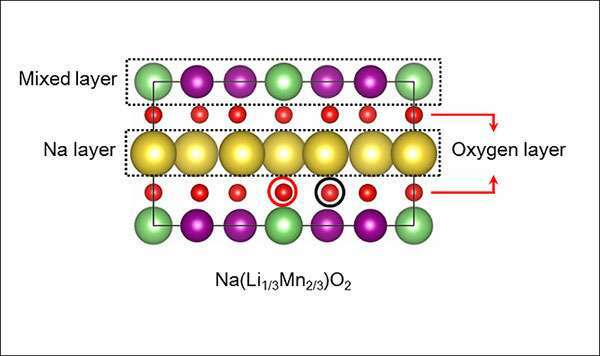 In the design developed by Cho and his colleagues, sodium replaces most of the lithium in the cathode, and manganese is used instead of the more expensive and rarer elements cobalt and nickel. "Our sodium-ion material is more stable, but it still maintains the high energy capacity of lithium," Cho said. "And we believe this is scalable, which is the whole point of our research. We want to make the material in such a way that the process is compatible with commercial mass production." Based on their knowledge of the physics and chemistry of other experimental materials, the researchers attacked the problem with rational material design. They first ran computer simulations to determine the configuration of atoms that showed the most promise before making and testing the material in the lab. Cho said his research is not just about coming up with a better battery. How the research was done is just as important and as interesting, he said. "When Thomas Edison was trying to develop a light bulb, he tried thousands of different materials for the filament to see which ones worked," Cho said. "To solve very important engineering problems in society today, we need to develop lots of new materials—battery materials, pollution control materials and others. Edison was perfecting one item—the light bulb—but we have so many more technological needs. We don't have time to keep trying to accidentally find the solution." Could a seawater battery help end our dependence on lithium? Your technique is too slow; however, effective. Definitive? The particle motion, particle as a set of charge pairs, this maintains molecular control, any other would be selective for the charge, i.e. your current control. Note: the charge pairs are a wiggle. From there it's mostly thermal, i.e. more pairs, get it! Remember this is juz physics. What they did is physics. What you are burbling are...insane ramblings. Why do you even bother? Waiting for @Eikka to come tell all us idiots why it won't work. Juz, say'n Why can't we simulate all possibilities? Capital, ManPower, ROI, Expense, schedule? You know, logic, finance, physics, compsci! I know, far above your head! Economic advantage! That is, what we do is in synch with what is needed, even if it means designing $hit to design $hit, if its possible, WTF? There is no box! Insane rambling indeed. If you are not listening, don't answer. Who actually reads "ramblings"? The accomplishment is grand! Look at the process to the accomplishment! Simplify! Else you did not learn squat! Oh forgot, you're a CEO of a phone company, not a modern tech leader! anti- are you a negative bot?